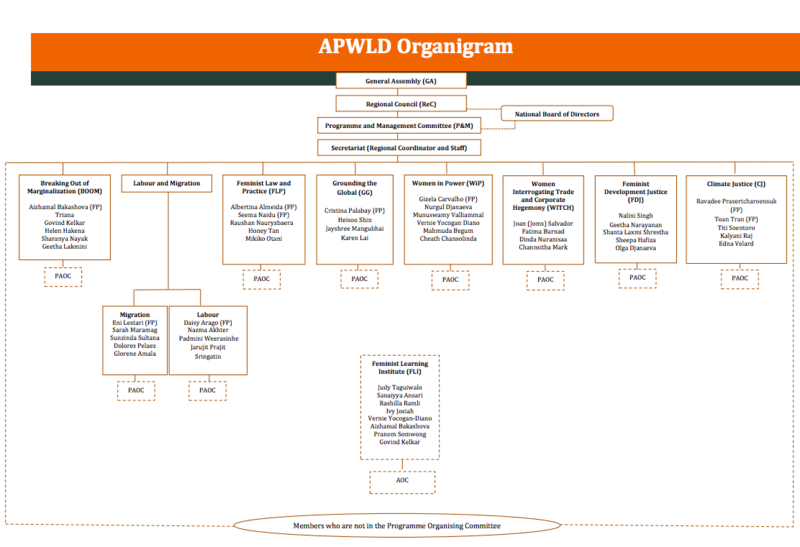 APWLD takes its direction and governance from its diverse membership. 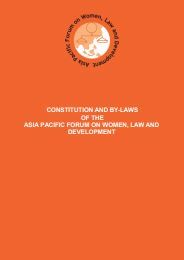 It is composed of 235 non-governmental organisations / civil society organisations or networks including feminists / women’s rights organisations, people’s organisations, and other human rights/development organisations as well as individual members from 27 countries in Asia and the Pacific. Our membership provides the strength and expertise that drives and executes our work. Members are actively involved in APWLD’s programme work through taking part in Programme Organising Committees (POC). APWLD is governed by a Programme and Management Committee (P&M) comprised from a larger Regional Council (ReC) of active members. Our Secretariat in Chiang Mai and satellite office in Penang carries out day-to-day operations and provides programme implementation as well as financial and technical support. The General Assembly (GA) is composed of all APWLD members, including Regional Council (ReC) members, Programme and Management Committee (P&M) members and Programme Organising Committee (POC) members. It meets every three years to discuss matters significant to the direction of the organisation including membership. The Regional Council (ReC) of 22 representatives is nominated from the members and meets every year to decide on matters of membership, sets programme agendas and directions and creates the programme organising committees. The Programme and Management Committee (P&M) oversees the management of the programmes and administration of the APWLD carried out by the Secretariat. It meets quarterly with the Secretariat to ensure the proper implementation of programmes by reviewing and approving programme plans as well as budget and financial administration of programmes. The Secretariat implements the direction of programmes with the supervision of a Regional Coordinator. Each programme is composed of a Programme Officer assisted by a Programme Organising Committee who are nominated from the Regional Council. Programmes may also create a Programme Activity Organising Committee for specific endeavours such as campaigns to facilitate guidance from members.